When you receive a shipment, you usually see a number of shipping markers on the shipping boxes or crates. If you have ever wondered what they would be, then you are in the right place; we are here to explain them to you. When you take a shipping box, there are the main marks (the length-wise of a rectangular shipping box) and the side marks. On these sides, numerous amounts of shipping marks that may be used to ensure that the boxes are handled properly and make the transporters life easier during transit. Also, these shipping markers will also ensure that those who handle the cargo, will not only be able to identify the shipment but also let them know the type of cargo. The following are some of the locations which the shipping markers may be placed. Some of the shipping markers are pictorial whilst some of them are textual. They can be stencilled once loaded in. In many cases, coded marks are included to when describing the content or type of products of the shipping box so it may not be susceptible to theft. In the event of a shipping box requires special handling, not only will it be denoted in the shipping markers but also mentioned in the Bill of Lading. Any handling information should be legible, and if the cargo is being sent to different countries, then the languages of the origin and destination port will be used on the shipping boxes. Using pictorial shipping markers, it makes life easier when there are many port stop in different countries of different languages. 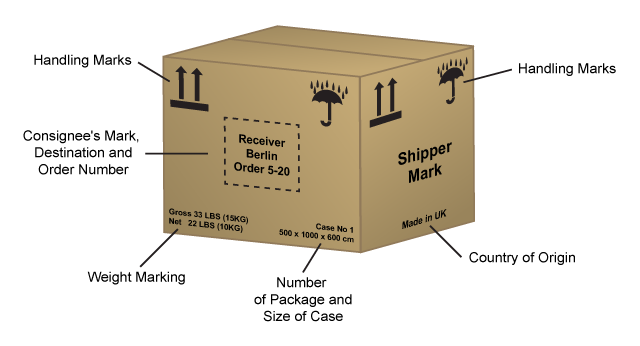 The following includes a guide of the standard pictorial shipping markers that are used for shipping boxes and crates. The most important shipping markers include featuring the orientation label, primary class label, standardised UN certification, shipping name, UN number, and subsidiary class label when shipping hazardous materials that need to confirm to UN shipping regulations. Apart from the above, when it comes to certain types of shipping markers, a shipping boxes should also include the net weight and gross weight, description of the goods, and the number of items that are included within. When these shipping boxes are then added to a pallet, the pallets too will include shipping markers such as the ISPM 15 Mark, pallet type, net weight & gross weight, and the number of boxes per pallet. Respectively, there will be container shipping markers will include container dimensions, container number, the container type, the container owner, and the seal number.